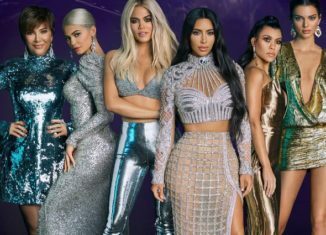 “Beneath the glitter, family is gold.” This new catchphrase for season 16 of the reality TV show Keeping Up With the Kardashians is making fans very excited for what is to come. When it comes to the ongoing saga of the Kardashians/Jenners, this season is truly about family over anything. Viewers are expecting big surprises as well as twists and turns. The first episode kicks off with exciting news to get the fans interested; Kim Kardashian and Kanye West are expecting their 4th baby! Not only that, but Kourtney and Khloe Kardashian go to their Palm Springs home for a girls weekend with a bunch of friends; meanwhile, Kim and Kanye take on the city of Chicago and bring their daughter North along. As seen in the premiere episode, it was really important to Kanye that he show his hometown of Chicago and his humble beginnings to the fans. In addition to everything going on, Scott Disick, the father of Kourtney’s children, spends a lot of quality time with Mary Jo, Kris Jenner’s mother. This was really nice to see as it exhibits Scott’s close connection to the family despite the fact that he and Kourtney have been separated for a while. We will definitely be expecting to see lots of Scott this season! Kylie Jenner made a small appearance on the episode, but between being a fairly new mother and running her own successful makeup line, Kylie Cosmetics, we can not expect too much of her this season. Presently, the Kardashians/Jenners have been the center of social media over the past few months due to prominent personal problems going on in their lives. Khloe has had to deal with her boyfriend and the father of her child, Tristan Thompson, cheating on her. To make matters even worse, Jordyn Woods, an extremely close friend of Kylie’s and the family’s, was reportedly the one who cheated with Tristan. Since this was all unfortunately made public, it is more than expected to be explored in an episode and will most likely close out the season. So what should we expect to come after just the first episode? It sure will be a lot! We will get a rundown on the California wildfires, Kanye’s Sunday services, and most definitely updates on relationships upon relationships! It is truly crazy that the show is now in its 16th season, but it just shows that despite some negativity, this iconic family is still at the center of entertainment. Just like the Kardashians/Jenners would say: with family, anything is possible!